I have an acquaintance who’s recently been diagnosed with coeliac disease. She’s an old lady and I think when her doctor told her, she didn’t know what that doctor was talking about. Suddenly they wanted to change her eating habits and told her that she had to cut everything with gluten from her diet. Since I have experimented a bit with gluten-free baking before I told her I could help her a bit with the transition and give her some ingredients she might need. So that same evening I grabbed some gluten-free flours, gums, and binders and took F. along to bring those items upstairs. When the neighbour saw that I had brought F. along, she took her to the living room and handed her a huge box of homemade shortbread cookies. “I can’t have them anymore”, she told F. “You can eat them and when you are done, you can bring me the box back.” F. didn’t get what was going on and just thought she had won the jackpot. But I thought that if we had to bring back that box, I wanted it to be filled with gluten-free cookies. 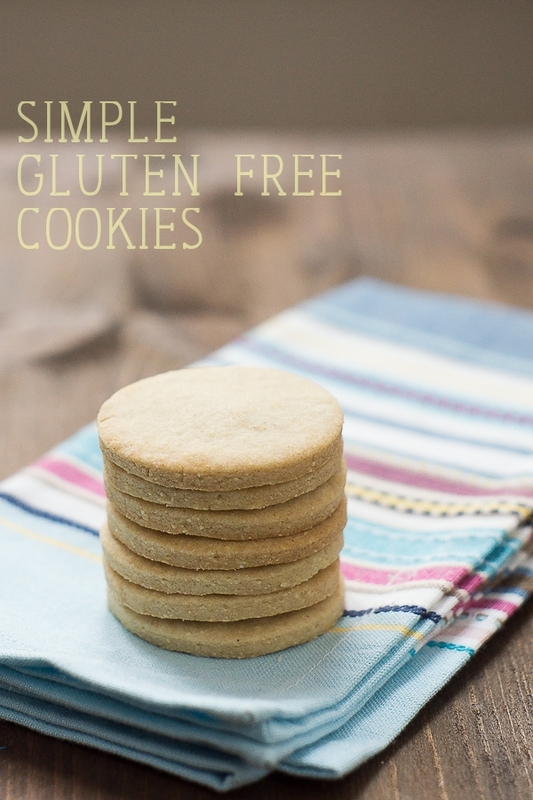 Last week I tried to make some gluten-free shortbread cookies. I started with my basic shortbread recipe and learned a lot. My cookies turned out rock hard and they looked greasy. So I reduced the amount of sugar and fat. Still a bit too crunchy and too sweet. I increased the amount of flour. This time the dough was too crumbly and wouldn’t hold together. I added some soy milk and this time the cookies came out great. That is, I think the texture was perfect but the taste was a bit different from what I am used to. Not bad though, just different. I guess it’s my lack of experience with gluten-free baking that blocks the road here. I just cannot tell you how good or bad these are because I can’t compare them. Since I wanted to make these cookies as simple as possible I used ingredients which are easy to find in our neighbourhood. I have never seen sorghum flour, which so many people seem to use in their cookie recipes. And teff is very expensive. That is why I made my own flour mix with 150 g brown rice flour, 150 g millet (ground in a coffee mill), 150 g potato starch, and 2 teaspoons of guar gum. Since these cookies are very basic I wanted to add something special to them. And what is more suitable for this task than caramel? 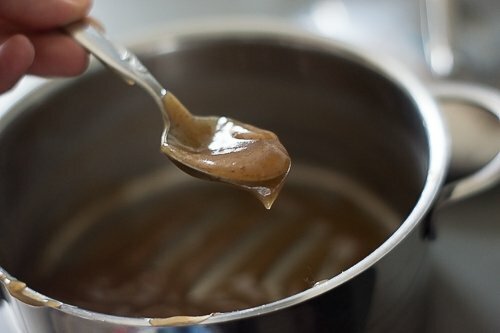 I made a simple caramel sauce by boiling almond milk and sugar. Once it had cooled down I whipped it up with some coconut oil to use it as a frosting for the cookies. I am so glad I did this because this frosting transforms every average cookie into an outstanding cookie. 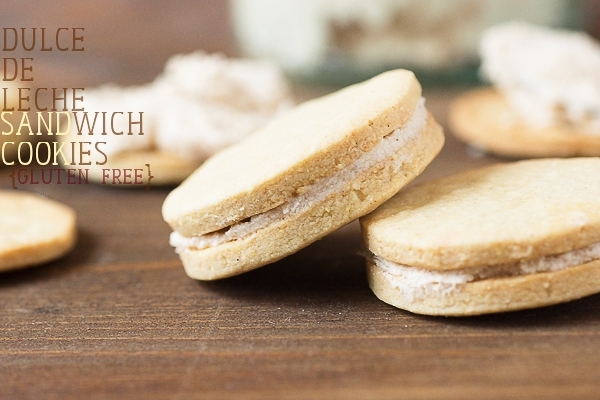 No matter how different they taste from your average wheat based cookie, as long as you put a teaspoon of this dulce de leche filling between two cookies, it doesn’t matter. *I strongly recommend to weigh your flour instead of measuring it with a cup. In a large bowl, beat coconut oil and sugar until fluffy. This will take about 2-3 minutes. Make sure everything is blended well. The mixture should look white and airy when done. Add remaining ingredients except for soy milk. Beat until crumbly. Now add the soy milk and knead the dough with your hands until the flour is incorporated well. Shape into a ball. Roll the dough out between two layers of plastic wrap. Mine was between 2-4 mm thick. Cut out cookies with your favourite cookie cutter and place half of the cookies on the baking sheet. They won’t spread. Bake for 8-10 minutes, until the edges start to get a golden brown colour. Remove from oven, let cool and transfer to a cookie rack. Bake remaining cookies. Place all ingredients in a small pot and bring to a boil. Whisk until the sugar is dissolved and make sure the milk doesn’t boil over. Reduce heat and let the mixture simmer for 35-40 minutes, until it has turned into a thick sauce. The mixture should be thick but not very sticky. Make sure to check on the sauce from time to time as the cooking time can vary depending on the setting of your stove top. Let the sauce cool completely before making the frosting. Place sauce and fat in a bowl and use a hand-held mixer to beat until fluffy. Spread the bottom of a cookie with 1/2 to 1 teaspoon of frosting and top with a second cookie. Repeat with the remaining cookies. These look simply beautiful! I’m not gluten intolerant but I have definitely been enjoying experimenting with GF foods and incorporating more into my diet. I definitely want to try these! Hi Ruby, thanks for visiting! Let me know if you make these. How fabulous to help out your neighbor! I hope she loves them. You did amazing, these look fantastic! This looks delicious! I have to try find millet flour but you’re right about all the other ones like teff and sorghum and what not – I can never bake GF without first tracking down a health shop, which always charges through the roof anyhow! How sweet of you to fill that cookie box back up with treats that this lady could enjoy! I’m sure your gesture made her day. Thank you for sharing your recipe; the cookies and the frosting sound fabulous, and I’m looking forward to treating myself to them. In case you’d like to share another simple cookie recipe with your acquaintance, Celine’s Amaretti cookies from Vegan Subs (also found here: http://havecakewilltravel.com/2010/05/16/amore-tti/) are still my favorite gluten-free cookies, and it doesn’t call for exotic, hard to find ingredients. I haven’t yet tried using them as a pie crust, as Celine suggests, but that option might come as a lovely bonus for this lady, since she now has so much to learn at once. Josiane, you are right! Celine’s amaretti are the best. Thanks for reminding me.I’ve made them a couple of times but forgot they were gluten-free. You biscuits look just perfect. Am sure your friend would have loved them. My sister and niece are celiac so I have had some playing with GF baking. I love chickpea flour – it is great though I think an acquired taste. However I have found it great to use in a brownie instead of regular flour because the chocolate will make sure the chickpea taste doesn’t dominate. I was also really pleased to see sorghum flour in a close by supermarket recently though am still to bake with it. Yes, she loved them and asked for the recipe. These are lovely. Dulce de leche makes all the difference in every food! I am sure your neighbor was ecstatic, as I would be too. And lucky us that you’ve done the experimenting to get these perfect. Das klingt toll. Ich bin immer noch ein wenig ängstlich was glutenfreies Backen angeht, aber vor allem wegen den fremden Zutaten. Gerade bin ich eher froh, dass mir meine Ärztin gerade gesagt hat, das ich kein Zöliakie habe. Ich werd mich also erst mal weiter an deine Rezepte mit Gluten behandeln. Irgendwann komm ich aber zurück auf diesen Post. Ok, you made my day : I just looooove dulce de leche cookies !